Geneva, Switzerland, October 2, 2018:The Minister of Internal Affairs, Honorable Varney A. Sirleaf has presented a request to the UN Refugee Agency, UNHCR, which among other things, called for more support to Liberia as it caters to a refugee caseload of about 9,454 Ivorian refugees in camps in Liberia. Of this number, Minister Sirleaf told the UN, 800 refugees have opted to be integrated in Liberia thereby obtaining Liberian citizenship, which is guaranteed under the refugee protocol. A press release from the Ministry quotes the Internal Affairs Minister as saying the Liberian Government has already secured 310 acres of land in one of the refugee hosting areas to support the local integration program for those opting to live in Liberia. He however requested the UNHCR and other partners to assist with the construction of quality, duration, and modern housing units similar to President Weah’s proposed low cost housing project. Though Minister Sirleaf acknowledged the collaboration and support of UNHCR-Liberia, more was needed to be done. 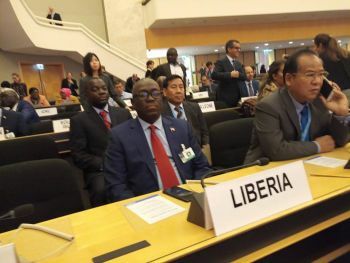 The Internal affairs Minister was speaking Monday in Geneva, Switzerland, when he presented Liberia’s refugee situation at opening of the 69th Session of the UNHCR General Assembly. The Minister is in Geneva along Honorable Festus R. B. Logan, Executive Director of Liberia Refugee Repatriation and Resettlement Commission-LRRRC. In the statement, the Minister who heads the Board of the LRRRC disclosed that the Government of Liberia continues to allow persons fleeing persecution to seek asylum in Liberia. “In 2018, of the 33 asylum applications in the country, 5 have been granted refugee status”. He said. He assured that Government, under the leadership of President George Manneh Weah is aimed at continuing the efforts of past governments by fostering the peace process toward national reconciliation, through a well-envisioned Pro-Poor Agenda for Prosperity and Development of which the refugee program is aligned fully with. Honorable Sirleaf told the UNHCR that as a mark of commitment of the Liberian Government, President Weah on July 26, 2018, Independence Day of Liberia, achieved a major milestone when he issued Certificates of Naturalization to 375 former Sierra Leonean Refugees; and is in the process of completing the civil documentation for the residual caseload of 1,101 former Sierra Leonean Refugees living in Liberia. He said over the past years, Liberia has made great gains in providing durable solutions to refugees, asylum seekers and other persons of concern (POC) living in Liberia. The Minister boasted that refugee services which traditionally were handled by the UNHCR, have now been integrated in the national framework, where both Liberians and refugees have access to and getting the same services. “These services include Health, Education and Social Protection”. He emphasized. Minister Sirleaf noted that amidst global challenges in providing sustainable durable solutions for the refugee cause, the Government of Liberia has shown 100% goodwill to support Durable Solutions, including Local Integration, for any refugee living in Liberia. The Internal Affairs Minister said steps have been taken to develop a comprehensive national Local Integration Strategy to promote assimilation and peaceful co-existence for all refugees who will opt to integrate in Liberia. He stated that President Weah’s Administration remains committed to improving existing domestic legal norms one of which is the ongoing revision of the 1973 Alien and Nationality Laws (ANL) which restricts Liberian women passing their nationality to their children. Once amended and passed by Parliament, this will a positive step towards preventing statelessness. He also made reference to efforts being made to domesticate international instruments include conventions relating to Statelessness Persons and the 2009 Kampala AU Convention on Internal displacement. Meanwhile in response to the report of the Liberian Government, Filippo Grandi, High Commissioner of the UNHCR praised Liberia for it achievements, noting that the UNHCR was proud of Liberia’s progress as a success story after years of civil war. He promised that the UNHCR would work closely with Government for the wellbeing of refugees in the Country. In an earlier opening address, the UNHCR Boss said the 69th session of the Executive Committee comes at a time when global forced displacement has climbed to an unprecedented 68.5 million, including 25.4 million refugees and 40 million internally displaced people. Liberia is among over 132 countries that are participating the UNHCR Executive Committee meeting. Meanwhile, a high level meeting involving heads of government delegations focused on the Ivorian refugee situation is expected on the margins of the Assembly shortly. According statistics Liberia hosts the highest number of Ivorian refugees in the West African sub-region.